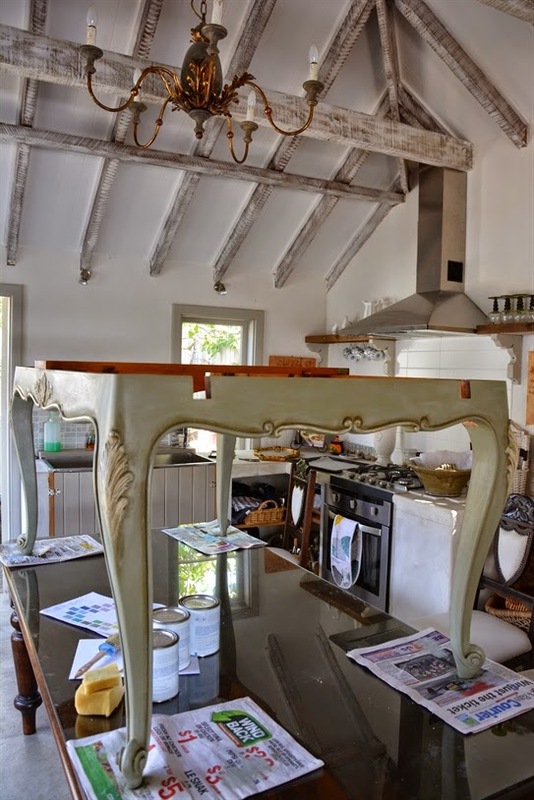 I am still Chalk Paint™ crazy and just about to begin an exciting new project, I have to admit though, I haven't tackled anything quite as beautiful as the French table Kaye has just completed. 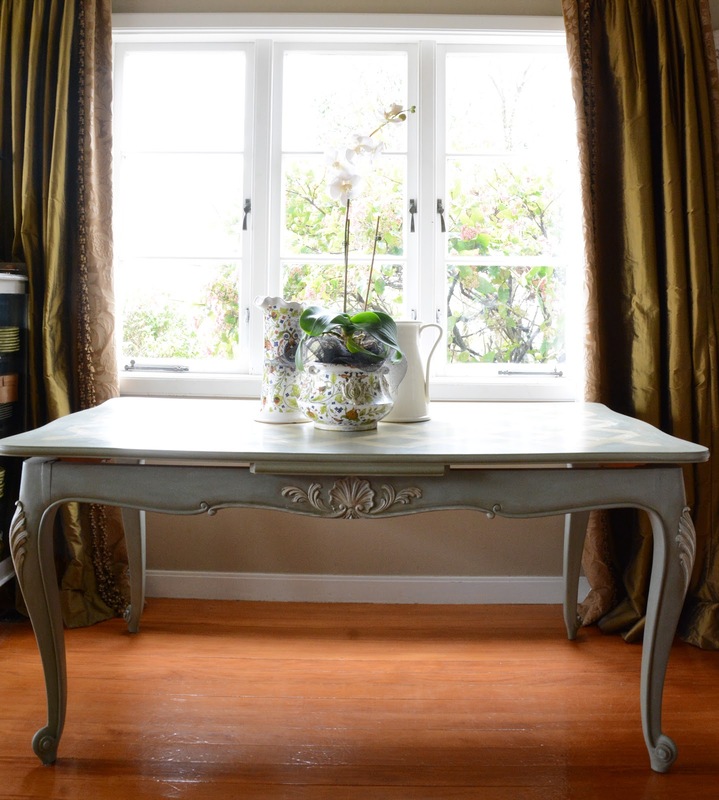 Kaye, Owner of Curtainalia & Bel Cuscino, spotted this 1950's French parquet table in its original honey coloured wood. With paint finishes becoming increasingly popular Kaye knew exactly how she could enhance this piece. 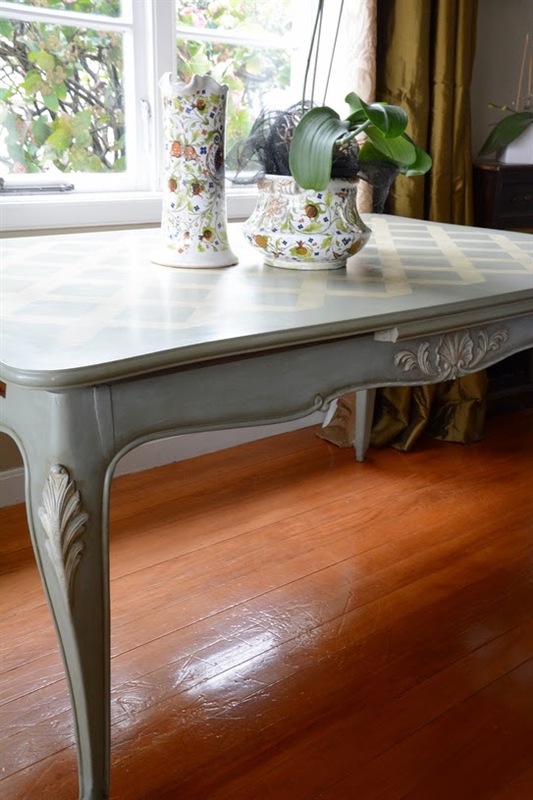 Using two different colours of Chalk Paint™ Kaye followed the original parquet pattern on the top of the table and enhanced the carved detail on the skirt and legs. The final result is a beautiful table with new appeal. 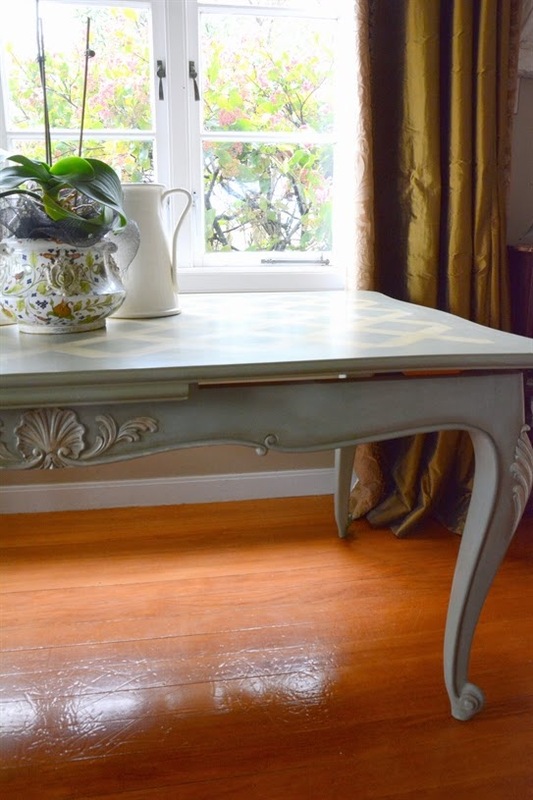 Kaye first painted the table base with two coats of Chalk Paint™ in Chateau Grey (allow drying time between coats). 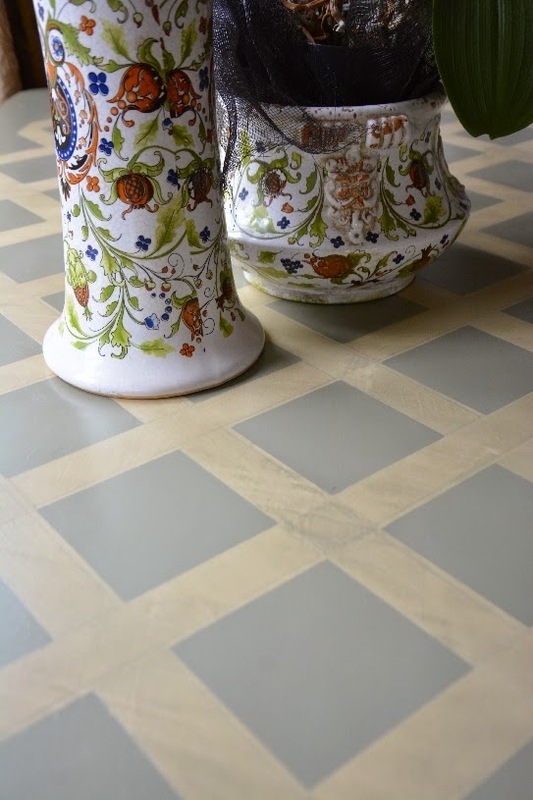 This colour is a 'greyed green' and often seen in French woodwork. Old Ochre was brushed on to the carved detail using a dry brush technique Dry brushing, you can enhance certain areas without covering them entirely with paint. When completely dry a wash of Chateau Grey was applied over the skirt and legs. After fully dry, a coat of 'clear' wax was applied and buffed, followed by a thin coat of dark wax which was used a little more to enhance the carved areas. Once the wax was dry, the table legs and skirt were polished by hand to give the wax a nice sheen. Above: After a wash of diluted Chateau Grey was applied and dried, a thin coat of clear wax was applied and buffed. A layer of dark wax was then applied and wiped back before being polished off by hand. First Kaye taped off the diagonal pattern using masking tape to cover the parquet pattern so that when it was painted over and then peeled off, the parquet would still show. 2 layers of Chateau Grey were painted over the entire top, allowing drying time between. Once dry the tape was peeled off to reveal the wood parquet effect. Kaye then masked off the diamond pattern one way and painted 2 coats of old Ochre in between the masked area (allowing drying time in between coats). Note: The lines of the parquet could still be determined through the paint which made it easy to apply the masking tape. Once dry she masked off the opposite direction and painted 2 coats of Old Ochre. Remove masking tape once dry. A wash of Chateau Grey was then applied over the whole top as per the base. When dry, the top was given a light sanding and then a builders pencil was used to accentuate the parquet effect. As the table needed good protection, kaye used a clear matt sealer which she painted on and allowed to dry. A coat of clear wax was applied and polished off, then a coat of dark wax. (Note: you could just use a sealer with a semi gloss finish or semi gloss varnish and omit the wax if you wanted to). There is no need to use a sealer on the legs and skirt of the table, wax is adequate for these. This gorgeous table is for sale, so if you are interested, please leave a message on Curtainalia & Bel Cuscino Facebook page or contact Kaye direct. Contact details can be found on her website. I absolutely fell in love with this table. Beautifully restored. Isn't it just divine, she made a beautiful job of the painting. It has inspired me and I can't wait to start the new piece I have just bought. It is quite different, antique bamboo side table and I have grand ideas for it.